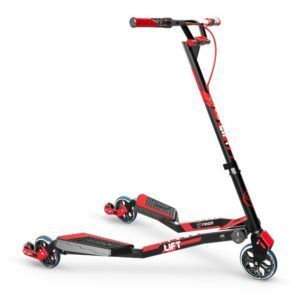 Fliker Scooters - Are They Any Good? What is a Fliker Scooter? Fliker scooters (also known as tri, wiggle or carver scooters and sometimes spelt as Flicker) have been around for a few years now. They have two footplates instead of one. Each foot goes on a separate footplate. The rider then shifts their weight from side to side or moves their hips to propel the scooter along. Sometimes this looks like they are wiggling (hence the term wiggle scooter). The rider can also ride the scooter in a traditional way (pushing the scooter along with just one foot while keeping the other on the footplate). Or you can even do tricks on them by flicking them up on two wheels. Why Get a Fliker Scooter? Reason number 1 - they are fun! In an age where kids aren't getting outside enough for fresh air and exercise, the Flicker scooter is a novel way to encouraging kids to move and enjoy their time outdoors. Reason number 2 - it's good exercise. It gets kids moving in a different way. They're friend will be desperate to have a go too. What Age for a Fliker Scooter? There are Fliker scooters for kids from around the age of five, although some five year olds may struggle to get used to the idea. It will really depend on the child, but most should be fine for age 6 or 7. Fliker scooters haven't been around for very long! This innovative scooter design came about from the well respected scooter maker and brand Yvolution. Yvolution created something that was very different from the other kids scooters you see on the playground. And the fun factor of the Fliker design made the incredibly popular with chidren in a very short space of time. Yvolution make various types of Fliker scooter. 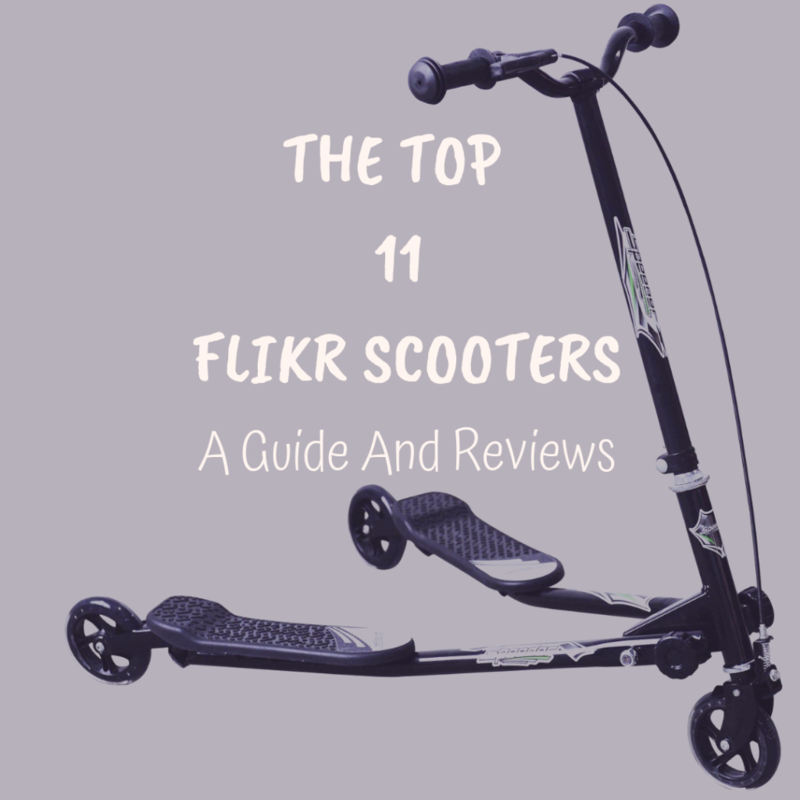 Beginners on the Flikr scooter will enjoy the Air series Y Flikers which are lighweight, sleek, sturdy, durable, great to learn on but also offer different challenges as their skills progress. Once kids have mastered drifting, they can move onto mastering tricks. The A1 air scooter is the smallest of the fliker scooters, designed for kids aged 5 and up. It's an ideal first fliker for beginners and younger riders as it's easy to ride and very safe. What's To Like About This Scooter? A quick response handbrake - easy to use for younger riders. Performance rated PU wheels - Industrial designed super-grip caster wheels offer a smooth, comfortable and easy glide journey. Twist and stow folding system - Simply twist and pull the folding knob and fold the handlebars to the ground. Suitable for neat storage in garages, storage rooms, or even for travelling in the car. It's the smallest in yvolution air range of scooters. Frame size is 85 cm in height and 46cm in width. At 6kg this is a lightweight frame for a Fliker scooter making it easier for younger ones to control and parents to pick up, fold and carry when needed. The A3 Air Y Fliker scooter is from the makers of the original fliker scooters. It's aimed for kids aged 7 and up and provides reinforced frame, high grip footplates, quick response brake and a foldable handlebar. The twist and stow folding system - it's ready to fold and go where you want to take it. The Homcom brand of scooters are branded and sold by a company called MHStar based in the UK. They are mainly sold via amazon and ebay and you can read lots of reviews of the scooters on these sites. The standout feature from the Homcom brand is the price. They provide a scooter an afforable option of tri scooter which has good reviews at a competitive price. The Homcom tri scooter is affordable with some impressive features. It's foldable, aimed at kids aged five plus. A fine option to go for when you just want to have a go and try this kind of scooter out. This is an affordable option of tri scooter for the younger rider. It's frame size is a good option for 5 to 7 year olds age range. It can be folded down - convenient if you want to put it in the boot of the car and for storage. With 125mm PU wheels, the scooter is designed for easy acceleration, drifting and turning. If you're looking for an affordable bigger and faster scooter for kids aged 8 and up, the Homcom ticks all those boxes. The larger frame and bigger wheels make this an excellent choice for older kids especially if budget is an important consideration. This has some excellent features for the kids aged 8 plus (including a height adjustable handlebar) without the huge price tag. The anti skid and wear resistant footplates are a larger size at 33cm (l) x 10cm (w). Very useful for bigger feet! The front handbrake makes it easy to control and slow down. Heavy duty steel frame. Frame size is 103cm in height and 63cm in width. Bigger than the Yvolution A3 scooter. The handlebar is height adjustable which means you can get the ideal height for your child. It adjusts from 76cm t0 100cm. The bigger 145mm PU wheels provide a faster, smoother glide. Bigger wheels are always better for taking you further faster and tend to roll over cracks in the pavement smoothly absorbing more of the impact making from nastier bumps. The max user weight is 60kg which will rule many adults out of having a go but is enough load capacity for older children. The Kidzmotion tri scooters are branded and sold by a UK company. These can be bought on amazon or direct from their website. Again amazon have many reviews of their scooters. It's notable that Kidzmotion offer tri scooters designed for and aimed at the older child and teenagers. The Kidzmotion Wrigger is a mid range scooter, with sizing and design perfect for the 5 to 9 age group. It's another top pick for a beginner with height adjustable handlebars and it's foldable too. What's To Like About This Scooter. An excellent option for beginners to learn drifting, master sliding and try wheelying. A height adjustable handlebar for 78 to 87cm ensures the scooter is set at the best height for each child. The width of the frame is 60cm. Wriggler is foldable for easy storage and features a cable front brake and twin rear brakes make it easy for young children to slow down stop. The maximum rider weight 85kg so the load capcity will easily fit the age group required. The Kidzmotion Swagger is a mid range priced scooter, with larger sizing and perfect design for the 10 to 13 age group. It's another top pick for a beginner with height adjustable handlebars. And it's foldable too! There's not many flikr style scooters with the ideal sizing for the 10 plus age group, which makes the Swagger the obvious choice for the older child. It's geared up to be a comfortable, awesome ride for kids who are a little big bigger and can handle more speed. The handlebars on the swagger can be adjusted between 96cm to 110cm so reach incredibly high to adapt to the height of the tallest of children. The width of the frame is 60cm. The 145mm PU rear wheels are bigger and will get kids a longer way in a shorter time. The Swagger is foldable for easy storage and features a cable front brake and twin rear brakes make it easy for quick braking and emergency stops. The maximum rider weight 100kg so even adults will be able to have a go on this thing. Do you want an even bigger frame for a teenager? The Kidzmotion Shway is the choice for you. It's extra large frame and extra large wheels provide teens with a fast, fun blast of a ride. This is the only self propelled Flikr style scooter designed with the teenager in mind. It's unique in that it has 200mm wheels which are the largest found on this type of scooter. Bigger wheels will glide more smoothly, so the Shway will be quick and rollover those bumps and cracks effortlessly. The handlebars on the Shway can be adjusted from 110cm up to a whopping 117cm so teens will be able to find a comfortable handlebar height regardless of how tall they are. The 200mm PU rear wheels will glide at a super speed giving teens the adrenaline they crave. Like all other Kidzmotion self moving tri scooters the Shay is foldable and features a handbrake for ultimate control when stopping. The maximum rider weight 100kg. There's nothing to stop adults within the weight limit joining in the Flikr fun with this socooter. The Yvolution Carver scooter are designed to take kids of all ages to the next tier of Flikr scooter. It works in the small way as the other Flikr scooters, shifting your weight to self propel along. But once you have used these scooters to get up to speed on basic drifting you can up your skills to the next level. The scooters feature FLEX technology so you can open up even more options for carving, including 360-degree spins (while in motion) and powerful carves with maximum control. The carver scooters are the perfect option for kids with a daredevil streak who like a bit of added adrenaline with their ride and are open to having a go at a few tricks. The are 3 versions of the scooter, the C1 designed for kids age 5 plus, the C2 aimed at 7 plus and the C3 aimed a 9 plus. Check them out below. The C1 is sized for the smaller, younger child with a daredevil streak. It's recommended for kids from age 5 and from 113cm tall. This scooter is a good option for younger children who are beginning with a Fliker but want the option to progress to the next level of Fliker tricks. The frame is sized at 85.5cm high and 54.5cm wide. It's designed with safety in mind with a quick response brake for those urgent stops and rugged grips on the footplates, giving parents peace of mind when their young kids ride this. It weighs 7.5kg and has a max rider weight of 80kg. Awesome for tearing up the school run. Aimed at age 7 plus, the C3 is super fun and perfect for trying out wheelies. Pick up some speed, then lean back and pull on the handlebars to lift the front wheel. The quick response brake gives riders maximum control, quickly change direction and try out some impromtu spins. Simple lean on the handlebars to pull off 360 degree spins and mega drifts. The performance rated industrial caster wheels can really pick up some speed for more thrills and action. Ideal for racing and having fun. It features refinforced steel tubing for an extra safe and reliable ride. Like all carvers it's foldable for extra portability. The height of the scooter is 104cm so older kids, teens and the maximum rider weight of 100kg means that adults can also have fun riding this. Like all the other Yvolution Flikers, this scooter has very responsive hand brakes for ultimate control and performance rated PU wheels for speed. The name of this scooter say it all! It's set up with a revolutionary patentented lift system, which lets you pull of wheelies including sideways wheelies. The lightweight frame is geared up for insane stunts, spins and cool tricks. This is the ultimate Flikr for kids aged 7 plus (from 128cm) to learn incredible tricks and have maximum fun. Front and side wheelies, 360 degree spins, powerful carving and drifts are all catered for. The patented lift technology means that kids can lean back and pull wheelies without going back to far. It can also fold quickly and easily with the twist and fold storage system. Where Can You Ride these Types of Scooters? The scooters work best on flat and smooth surfaces. They don’t work well uphill or on uneven terrain. They are mainly used for fun than commuting. Can 4 Year Olds Ride a Flikr Scooter? Some 4 year olds can ride a flikr scooter, although others will struggle. It very much depends on the child, so it’s not possible to give a yes or no answer. The main thing is if you buy a flikr scooter for a 4 year old, go for the smallest frame size possible and choose a tri scooter designed for a younger rider . On this page that is the Yvolution A1 Air Flikr Scooter.